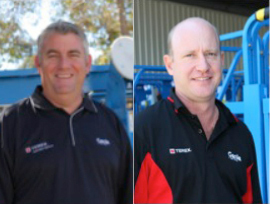 Terex AWP has announced two senior organisational changes to the Genie team in Australia with Reg Moss and Mitch Ely appointed to Darra, Brisbane, based positions. Experienced Genie team member Reg Moss, has been appointed to the position of Quality, Training and Technical Support Manager for Asia Pacific. Mitch Ely has been employed in the role of National Operations Manager at Genie Australia. In announcing these senior management changes, Genie Australia General Manager, Brad Lawrence, has heralded an even greater commitment to the support of Genie customers. Mitch Ely is no stranger to Genie. He joined the company in 1998, but left after ten years to pursue other interests. Immediately prior to returning to the Genie team, Mitch had completed a five year stint in the access industry in Brisbane. “I’m returning to Genie with a firsthand appreciation of both sides of the access industry,” Ely said. Genie is customer focussed, with an unwavering commitment to supporting customers with technical support, parts support and Genie Service training. Mitch Ely’s commitment to the aerial working platform industry is exemplary. He served as President of the Elevating Work Platform Association for four years. As National Operations Manager, Mitch will be leading the Engineering, Parts, Service, Quality, Training and Technical support teams. Within the re-alignment of departments at Genie, Reg Moss has been appointed to the position of Quality, Training and Technical Support Manager for Asia Pacific. Quality is fundamental to Genie. From the quality viewpoint, Reg is responsible for managing the Asia Pacific customer feedback and response system, establishing quality metrics and tracking our progress within the framework of continuous improvement. From a training and technical support perspective, Reg will be looking to build capability within the Genie aftermarket support team and customer base. Reg Moss has been with the Genie team for more than 9 years and enjoys strong relationships with both the customer base and teams in the factory. His technical knowledge of the Genie product is second to none.